We began our lesson on body parts by pointing to each part as I said it. After every 4 or 5 words, I went back and reviewed the previous few words. Next we sang, "Cabeza, Hombros, Rodillas y Pies" (Head, Shoulders, Knees and Toes) while performing the actions. Here is a link to a Youtube video of the song. To complete our introduction to body parts, we played Memory Match with body parts flash cards I created using Microsoft Word Clipart and business card paper. I always print 2 copies of the flashcards, and we use them in so many ways. Memory Match, Go Fish, and BINGO to name a few. We colored and read "Mi cuerpo es mi amigo," a make and take book from Scholastic's "25 Spanish Science Minibooks" book. I downloaded the entire Science Minibooks for $1 during Scholastic's dollar days sale, which I believe happens twice per year. To begin our vocab review, we played "Simón dice" (Simon Says) then sang "Cabeza, Hombros, Rodillas y Pies" a couple more times. Together we read our Scholastic Let's Find Out magazine, "Yo y mis 5 sentidos." We did a couple of the worksheets on the 5 senses that went along with the magazine. I wrote an entire post about Scholastic's Let's Find Out that you can read here. It's one of my favorite resources. We worked together to complete this online listening quiz from Oye Language Skills. The site is free unless you want to use it between 9:00 AM and 4:00 PM. Plan ahead!! To begin, we played Go Fish with the same body parts flashcards that I mentioned above. Next I got a small basket and a handkerchief to cover it. I placed Mr. Potato Head body parts in the basket and had the boys take turns putting their hands in the basket and guessing which body part they felt without looking. We watched the Scholastic video "Mi Cuerpo" that goes along with our classroom magazine subscription. For our grammar I introduced the concept of how to say something hurts in Spanish, "Me duele." We sang the song, "Dolor de la cabeza" off the Sing, Dance, Laugh and Eat Tacos 2 CD by Barbara MacArthur. Once I felt the kids were relatively comfortable using the grammar (and completely annoyed by the song), we played "doctor." I let the kids play around with the online game, "El cuento de todo sobre mi" from the Scholastic Let's Find Out website. I had 8 x 10 pictures of the boys printed, one of their front and one of their back. I created body part labels using Microsoft Word and Avery address labels. I had the kids label all the parts of their bodies (with a little help). Next we played Spotlight, which turned out to be the kids' very favorite activity. I put the body part flashcards in random places around my closet. Then we went in with the lights out and a flashlight. The boys took turns shining the flashlight and trying to find a body part card. Once they found one, if they were able to name it, they got to keep it. We read De la cabeza a los pies by Eric Carle and performed the actions as we read. I'm a huge fan of Eric Carle, and this book is one of our favorites! Throughout the book children are encouraged to get their bodies moving just as they see animals doing. 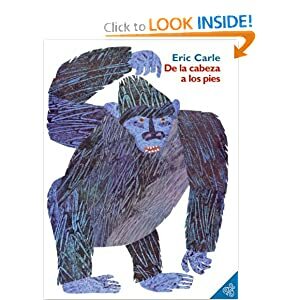 As most Eric Carle books, De la cabeza a los pies is highly repetitive, great for language learners. On the final day of a unit I usually let the kids choose which activity they would like to review with. My kids chose the Spotlight game. There's just something exciting about using a flashlight to search for hidden gems in the dark! Our last body part activity was to make a monster (monstruo). I had pre-cut shapes of different body parts for the boys to choose from. The boys picked out body parts and glued them onto construction paper to create their own monsters. To review colors at the same time, we discussed the name of the body part along with its color while the boys worked. Thanks for the Lesson Plan Process!